Nigeria’s Presidency seems set to reverse the decision by the immediate past administration of Goodluck Jonathan on the cancellation of the military training of Nigerian Armed Forces in the United States. Latest report indicates that President Muhammadu Buhari is now ready to restore the United States military program to train Nigerian troops. The training has become necessary because of what government calls ‘growing aggression in the north-east’. The military has been tackling a terrorist group, the Boko Haram, in the region for over five years now. The terrorists are trying to establish an Islamic State and end western education in the region. The U.S. Ambassador to Nigeria, Mr James Entwistle, insists that Nigeria and the U.S. have military training agreement. Mr Entwistle said:”We had at Nigeria’s request agreed to train some battalion. Some of the trainers in the world have been provided by the United States”. Former President Jonathan on December 14, 2014, ended the US government’s training programme for Nigerian soldiers. The Nigerian government requested for the suspension of the programme less than a month after Washington said it refused to sell the country Cobra attack helicopters. 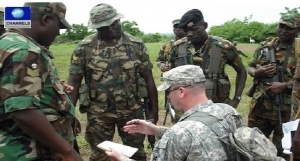 “At the request of the Nigerian government, the United States will discontinue its training of a Nigerian Army battalion,” the US Embassy in the capital, Abuja, said in an e-mailed statement.